Well well well another camcorder review. Panasonic camcorders are something I am quite well informed upon. 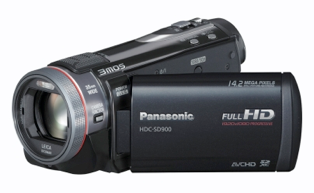 The last Panasonic camcorder I used was a DV model, not to bad for it's time but this the Panasonic HDC-SD900 is truly remarkable. I am one of those who got into my mind the only way to get great video at a moderately low price was to buy a DSLR like the Canon 600D. That notion has now been wiped from within me since receiving this camcorder. The exterior design is decent the whole body is matte black excluding the back of the flip out 1180 degree 3.5 inch screen which is glossy black. This does have a touch screen although it’s resistive based meaning it’s designed for a stylus but this is clearly intended for fingers so it should be capacitive. The back of the camera sits a big battery which will give you around 2 hours of recording and 3 hours of playback with full charge, which isn’t bad at all. You can purchase bigger batteries for longer record times but they will protrude out of the camera which i’m not a fan of. The HDC-SD900 has something which I was a little surprised to see on a camera nowadays and this is a view finder. It works just like any other view finder I have ever used and it’s in full color and I was definitely not expecting to see one, so if you like to have a view finder this camcorder has it. On the right hand side of the camcorder a very comfy carrying strap is to be found. It doesn’t dig into your hand and feels kind of like a marshmallow. The camcorder isn’t at all heavy and the actual build is very solid and rigid, it just feels really well made. To function for the main tasks you will use the buttons nearest to you when holding the camcorder, these include the zoom, the record button, the photo button, the trigger switch for entering different modes, a button to toggle O.I.S. (stabilisation) on and off and a manual switch to enter the menus. Then you have the buttons housed around the touch screen which are slow zoom and a record button. Then you have some more buttons which sit inside the living space of where the screen closes which are the power button and a button to turn the camcorder onto 1080 mode. All in all the buttons are straightforward enough to use and easy to get on with. The touch screen is the place to go to when operating the menu and viewing movies and photos and it works just fine but it should be capacitive. With 14.2 Mega Pixels onboard the Panasonic HDC-SD900 takes incredible still photos. This camera is all about the film really like all camcorders so still photos are a nice feature that usually don’t provide the same quality image as a compact digital camera. Photos were true to life with deep blacks very very vivid colors and when in low light situations it’s built in flash works a treat. Video taken is utterly remarkable. First off Panasonic have built in a LEICA lens and a 14.2 mega pixel sensor and an Advanced 3MOS System and Hybrid I.O.S and 12x Optical Zoom. All this combines together to deliver stunning and truly breath taking footage. Colors pop. It’s crazy crisp and clear. The auto-focusing is quick, it’s practically instant.The contrast and light intake is also very impressive having a great deal to do with that awesome lens and it performs exceptionally well in low light. I use iMovie to edit the footage and I transfer the footage from the camera using a USB cable which works absolutely fine and iMovie speaks to the camera with ease. Panasonic were nice enough to include iFrame which is an Apple video format, this works seamlessly when importing footage into the iMovie App on the iPad 2. The onboard microphone uses DOLBY DIGITAL 5.1 and it’s also like the video very crisp and clear. Sound is definitely coming from a 360 degree perspective which I have never seen on a camcorder before. When you play the audio back the zooming and overall camcorder noise operations are unheard. When playing back the footage I had taken you realise the true potential of what this camera can do. When you see what your shooting via the 3.5 inch screen it really doesn’t justify itself like when it’s played back on my 27inch iMac display. A few other things to note with the HDC-SD900 are that it can shoot in 3D with the appropriate accessory, you can hook it up via HDMI, it also works with VIERA Link and if you choose to do so you can plug an external microphone in and have a place to hold it on the camcorder. On the font of the camera you have a manual focus which you can choose to either use or not and you can choose for it to be a zoom. Overall the Panasonic HDC-SD900 is easy to use, light weight and sturdy, takes great photos, records truly stunning HD video, the stabilisation is incredible but because of that you forget all about it, auto-focusing is speedy, the inbuilt microphone is clear and crisp and battery life is long too. I wouldn’t hesitate to buy if you are looking for a camcorder that takes stunning video and has an all round awesome package of features. It’s the best camcorder I have ever used.